By all accounts, Nathan Frank started out as a terrific kid with the brightest of futures ahead of him. With the advent of adolescence, however, Nathan’s world and his relationships begin to unravel. No matter which way he turns, he seems to find conflict. Eventually, with his powerful personality, he becomes his own generator of conflict as he steadily enters a world of drugs, defiance and ultimately a criminal street gang. Finally, he runs off the rails at full throttle, coming to a hard stop at seventeen years old when he is arrested for his participation in a botched robbery. With his arrest, Nathan is swept into a justice system of condemnation and ruination for those who enter its control. There, the fact that he is a troubled teen means nothing – maybe less than nothing. Nathan is tried as an adult and sentenced to multiple life terms for his crimes. So at seventeen, he enters a world where exploitation, violence and abject hopelessness reign. Forgiveness, rehabilitation, redemption are hardly even notions within our justice and corrections systems. Logically, Nathan should be crushed by his fate. He very nearly is. But, the man Nathan becomes, a man who finds his strength in fundamentally good qualities that he suppressed for so many years, will not be crushed. Somehow, in one of the worst places on earth, he rediscovers the best parts of himself. 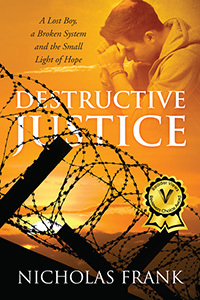 Destructive Justice follows Nathan from the great promise of his earliest years, to the great tragedy of his adolescence, to the small light of hope for an even greater redemption. Places we had not checked in the past were the neighborhoods between the cracks – where the near-ruined people, including the plummeting drug addicts, “lived.” Still convinced that drug use was his primary motivation, we thought he might show up there. The job I had in that town for many years covered every street. Consequently, I knew every neighborhood in town. I knew where the homeless were, where the gangs were and where the drugs were sold. As much as we did not want to think that Nathan might be there, we had to recognize that it was possible. So we searched the territories of hopelessness - where drugs erase minds and personalities, leaving behind wraiths that were once regular people who walked among us, where a poor soul who has overdosed is nothing more and nothing less than an opportunity for others to upgrade their footwear. Houses with weathered, half torn plywood on the windows, apartments that look like war zones, dead lawns and dying trees, junked cars, abandoned shopping carts, random boxes of ruined clothing, overflowing dumpsters, putrid pools of water with the carcasses of rats, cats and small dogs collect at intersections, old tires, and the remnants of playgrounds now marked with the tagger’s claims of ownership make up the landscape. The inhabitants of these areas stay hidden until nightfall. If you happen to catch someone in the light of day, you can feel it as they stare at you without actually looking. That’s because they are not looking at you. They are measuring you to see if you are a danger or an opportunity. In the hierarchy of such places, gangs, like demon overseers, rule according to a code that gives little to no value to life. We had no luck finding him that day. Later, when evening came, we went back over the entire route again. Nighttime is when the people who live in such places come out. The looks from the people at night were more direct, more menacing. We didn’t care who was trying to intimidate us. Our fear for Nathan’s well being made us fearless. We would have faced down anyone who meant harm to him, which would have been anyone who confronted us. Unfortunately, best intentions and courage are not all they are cracked up to be. We did not find him that night, either. After exhausting all of our hunches and ideas, Maddie and I dragged our selves back home. Nathan’s unstoppable descent into the underworld of bad was accelerating and we were not the force for rescue we wanted to be. Every time I turned on the light before turning in, I wondered if it and pitiful hope were all we had left to offer. Nicholas Frank (a pen name) is the epitome of an ordinary guy, except he and his family have lived through most extraordinary events. Those events serve as the inspiration for this book - his first and perhaps last. He lives with his beautiful wife in Southern California.